Team USA for the Pan American Games at podium training. Photo by Grace Chaui via USA Gymnastics. The first round of competition for the 2015 American Games started today in Toronto. The women began their Pan Am journey with the team finals and all-around and event finals qualifications in the first subdivision. They will have to wait through two more subdivisions for the results. Madison Desch of GAGE, Rachel Gowey of Chow’s Gymnastics, Amelia Hundley of Cincinnati Gymnastics, Emily Schild of Everest Gymnastics and Megan Skaggs of Gymnastics Academy of Atlanta make up the team. The format for the team competition is four up, three count. The USA started on floor with Schild, Skaggs, Hundley and Desch. Schild led off with a strong effort, scoring a 13.75. Skaggs went up next, and performed an artistically beautiful routine but struggled on her landings, almost putting her hand down on her last pass. She scored a 13.4. Hundley opened up her first competition in 2015 with a brand new routine that earned a 14.3. Desch finished up with the strongest routine of the rotation scoring a 14.65. Team USA earned a 42.7 on their first event. Desch and Hundley took the top two spots from America on floor, giving them both the opportunity to qualify for event finals. Skaggs, Schild, Desch and Hundley were all up again for Vault. As commentator Elfi Schlegel put it, team USA put on a vault clinic. All four girls performed solid double twisting yurchenkos, with scores that built along the line-up. Skaggs earned a 14.9, Desch a 14.95, Schild a 15.05 and Hundley led the team with a 15.1. A 45.1 event score put team USA at 87.8 at the half-way point. The line-up on Uneven Bars was Skaggs, Hundley, Desch and Gowey. Skaggs started off the event with a solid bar routine earning a 13.75. Hundley came up next with a solid routine chocked full of release moves and a tiny hop on landing for a 14.5. Desch performed a beautiful bar routine. Her release moves floated through the air with a beautiful swing in between for a 14.45. Gowey anchored the team with a very strong routine for her first outing in 2015 scoring a 14.75. Gowey and Hundley were the top two USA scores and team USA finished the event with a 43.7. Gowey dominates bars. Photo by Grace Chaui during podium training via USA Gymnastics. 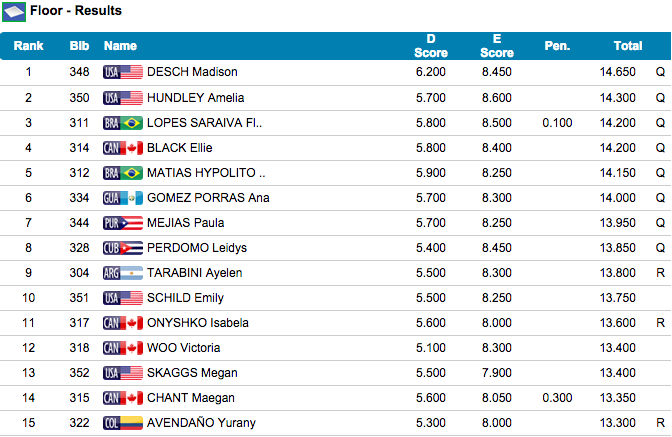 The USA ended on balance beam, with Hundley, Skaggs, Desch and Gowey competing. Hundley led off with a solid routine with just a few wobbles for a 13.750. Skaggs went up next with a nice flowing routine but had a deep bend on her dismount for a 14.05. Desch brought out a beautiful routine and but fell on a difficult hand-spring step out, hand-spring two feet to layout full, scoring a 13.25. Gowey ended the competition with a true Chow style routine- slow and steady, nary a wobble, with beautiful fluidity to score a 14.5. USA earned a 42.3 on beam, and Gowey and Skaggs were the top scoring Americans. Rachel Gowey is gorgeous on beam. Photo by Grace Chaui during podium training via USA Gymnastics. Team USA leads after subdivision one with a 173.8. Hundley and Desch are currently one-two in the all-around with a 57.65 and a 57.3 respectively, which is impressive for Desch with a fall. Hundley and Gowey are both in the running for two event finals, with Desch and Skaggs each in the hunt for one. Final results will be determined after two more subdivisions, including Canada and Brazil. Amelia Hundley qualifies in first into the all-around from team USA. Photo by Grace Chiu via USA Gymnastics. Six serious faces took on the World Podium today as the U.S. Women’s team made their first official foray into the 2014 World Championships. After a week of training and acclimating in Nanning, China, the U.S. women seemed ready for business during today’s podium training. And as has become the norm, they hit routine after routine on event after event. In 2011, the U.S. women’s program began a new era of dominance in consistency. Podium training, qualifications, team finals, all-around finals, and event finals look pretty much the same. Hit routine after hit routine. Compete, hit, repeat. Of course, there have been a few exceptions, but for the most part, gone are the nail-biting days of wondering if a gymnast is going to fall. Because, they just don’t. Aristotle has said “We are what we repeatedly do. Excellence, therefore is not an act, but a habit.” Martha Karolyi and the rest of the U.S. coaching staff have hit the sweet spot of making a habit of excellence, peaking their gymnasts at just the right time to hit every time on the world stage. The 2014 U.S. women’s World Championship team contains a number of gymnasts – five of the seven- who have not competed at a world championship level before. Every one of them has competed at an international meet at least once, but in the world of USA gymnastics, many of these girls are virtually untested. Most USA gymnasts begin competing internationally as juniors, and by the time they hit the senior ranks, they have had a number of international meets under their belt. But you would never have known it from podium training. Each gymnast went out and did what they are trained to do. Hit their routine. There were a few bobbles here and there but only one miss, a fall on beam from Ashton Locklear. Every other routine looked like it was coming from a veteran competitor, and Locklear looked fabulous on bars, the event USA is counting on her for. Veteran competitors Kyla Ross and Simone Biles have been helping the girls who are newer to the international stage. “I feel like I have helped them quite a bit, me and Kyla have led them through the ropes, and if they are having a down day we know what to say because we have been there.” said Biles in an interview with USA Gymnastics. And though it seems only yesterday that Ross was team baby, she has in fact firmly held the role of team leader the last two years. The women begin their bid for the medal podiums Saturday, October 4th at 6am EST. USA gymnastics will be livestreaming the qualification rounds for USA, Russia, China and Romania/Great Britain. They will also livestream the team, all-around and event finals in conjunction with Universal Sports. Check out the schedule to make sure you don’t miss any of the action. All livestreams, as well as individual US routines will also be archived on the USA youtube channel, where you can already watch a replay of podium training. Simone Biles made what everyone already knows official. At this point in USA gymnastics, she is in a league of her own. She decisively won back to back U.S. National Championship titles, this time by over four points – with a fall. Over a two day competition, she looked incredibly strong, relaxed and consistent until the very end of her beam routine where she fell. And when you are so far ahead that you are competing with yourself, that is frustrating. But on the scoreboard it hardly mattered. Biles also walked away with the national title on floor and vault. Kyla Ross won her second silver national all-around title, as well as her second national beam title. Ross is also in a league of her own this year firmly capturing the silver despite two uncharacteristic falls on night one. Ross proved to everyone that she is indeed human on the first day of competition with a fall on floor and on bars. Her almost inhuman consistency and perfection are marveled at around the world, and they returned in full force on night two, where she earned the highest execution score total. Maggie Nichols, the only gymnast on the medal podium to hit eight for eight routines, took the bronze. At this championship, Nichols put an exclamation point on her statement from the U.S. Secret Classics. She is a consistent all-around gymnast who can be depended upon to hit on any event. She also won the bronze on bars, an important event in USA gymnastics. Apart from the three all-arounders, Ashton Locklear made quite a splash at this competition, easily winning the uneven bars national title. Between the national championships and classics earlier this month, she has posted the highest bar’s scores in the world this year with her incredibly clean and difficult bar routine. The top six all-around gymnasts were automatically added to the national team. Additionally, four more gymnasts who were named to the Pan American Games team were also added. Ross and Biles, who have loads of international experience were left off the team, letting other gymnasts gain much needed international competition experience. Alyssa Baumann, Plano, Texas/WOGA, Simone Biles, Spring, Texas/World Champions Centre, Madison Desch, Blue Springs, Mo./GAGE, Brenna Dowell, Odessa, Mo./GAGE, Amelia Hundley, Fairfield, Ohio/Cincinnati Gymnastics, Madison Kocian, Dallas/WOGA, Ashton Locklear, Huntersville, N.C./Everest Gymnastics, Maggie Nichols, Little Canada, Minn./Twin City Twisters, Kyla Ross, Aliso Viejo, Calif./Gym-Max and MyKayla Skinner, Gilbert, Ariz./Desert Lights. The gymnasts leaving on a bus on Sunday to Canada to represent the USA at the Pan American Games are Baumann, Desch, Hundley, Kocian, Locklear, Nichols and Skinner. 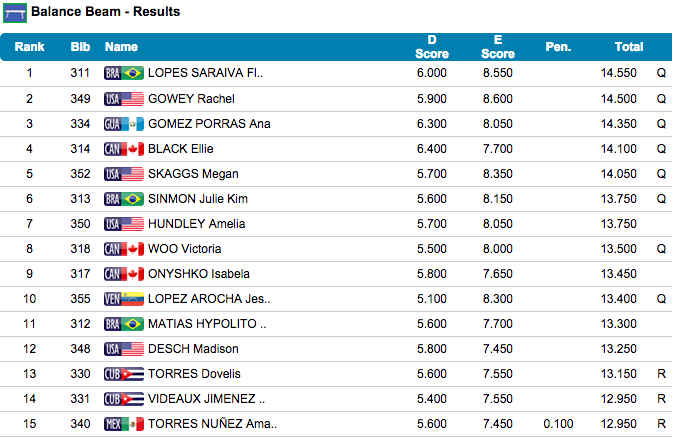 The results for the all-around top six and the even medalists are as follows.